Many of the maps in it have ~50cm/px resolution, whereas many MapKnitter maps (made from balloon, kite, and drone imagery) have 5-15cm/px resolution. And there are a lot of MapKnitter maps -- 1578 as of today. This means that referencing is pretty easy to do by hand - just upload the image, scale and rotate it into place. Or if your camera/smartphone has a GPS, MapKnitter will auto-place the image for you, using GPS, GPS altitude, and compass heading. The other side of this is that due to our recently launched Leaflet plugin Leaflet.DistortableImage (read a great in-depth discussion in @justinmanley's The Magic Behind MapKnitter), MapKnitter 2.0 displays georectified images natively distorted with CSS3, in the browser. Go ahead -- right click the image above, and open it in a new tab. It's not a tile layer. These aren't everyone's priorities -- they're distinct to our use case -- but there is a common thread. 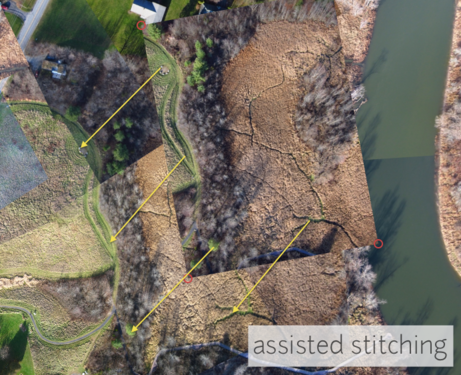 We've kept an eye on auto-stitching approaches such as what OpenDroneMap is finally making easier. But it's not an either-or situation. We feel that the ease (especially for non-programmers, or non-GIS folks) of simply placing an image on a map makes a huge difference for many folks. But a rough placement can make interest point matching much more efficient, and some automation (such as via GPS) can make manual stitching much more efficient. Let's converge by standardizing on the interchange format of the rectification data itself, so that images from MapKnitter can be used as an incoming dataset for OpenDroneMap, and eventually, we could use interest point matching to assist manual stitching -- perhaps by providing visual indications of possible matches, like semi-transparent "spiderwebs" connecting two nearby images. Just to throw out one more wild idea here -- I believe the matrix distortion calculations we do for Leaflet.DistortableImage could be re-used in WebGL to (someday?) generate exportable full-resolution versions of maps, in the browser. If possible, that would make this type of mapmaking hugely scalable! Want to talk more? Come to the Public Lab Open Hour ("Behind the Code") this Monday the 1st at 1pm ET -- we're having an online software development meetup. Intriguing opportunities for synergy across these platforms and approaches. Thanks.